Now your little one can dress up as the classic sweet mouse who is always seen in her signature polka dots! This Child Little Miss Mouse Costume is great for girls who love Mickey Mouse and who love to dress up. The ear headband with bows completes this cute costume. Just pick up some black tights and black shoes for the complete look. Become your favorite dainty Disney character with this Child Miss Mouse Costume! You'll look like a sweetheart in this adorable polka dot ensemble. Meet up with your gal pals Daisy Duck and Clarabell Cow for an afternoon tea party with tons of juicy gossip. She can start her own club and be its leader in this Child Missy Mouse Costume! Add a Disney-themed trick-or-treat bag or pail, and black tights & shoes to complete the look. Perfect for more than just Halloween--she can wear it for a dance program or for everyday dress-up play, too! Be the cartoon mouse nobody can resist in this Flirty Mouse Costume. Finish your look with red or black shoes and anklet socks or fishnet tights. Then, if Micky isn't already the jealous type, he will be! Did you know that Minnie's real first name is Minerva? We like keeping it short and sassy too! Transform into your favorite sassy cartoon mouse in this Girls Adorable Miss Mouse Costume. Lead the crowd in cheering for team Minnie in this Girls Minnie Mouse Cheerleader Costume. 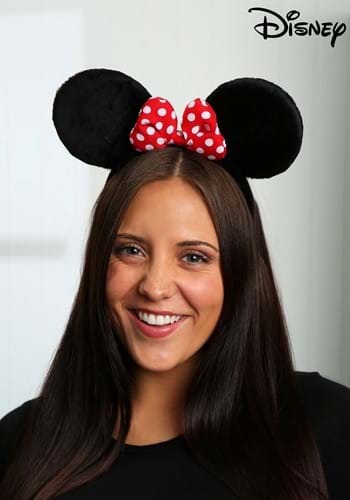 Add glittery pink shoes and a Disney treat bag and you can cheer Minnie and all the Disney stars to victory! They say that Mickey Mouse is the leader of the club, but we like to think Minnie Mouse is really running the show! She's got a unique sense of style that can't be beat. So join up with the rest of the fab Disney characters when you go in this Girls Pink Minnie Tutu Prestige Costume! This Infant Baby Mouse Costume will give your little girl an instant membership in the Mouse Club! Add black shoes & tights and a Disney-themed treat bag or pail, and she's all set for her Halloween event. This costume would be great for a dance recital, too! Minnie Mouse made her first appearance all the way back in 1928. That mean's she's over eighty years old! Minnie has come a long way since those old black and white shorts, and each new generation has come to love those characters. This next generation is no different, so start their love of Disney early with this adorable Minnie Mouse bib and hat set! 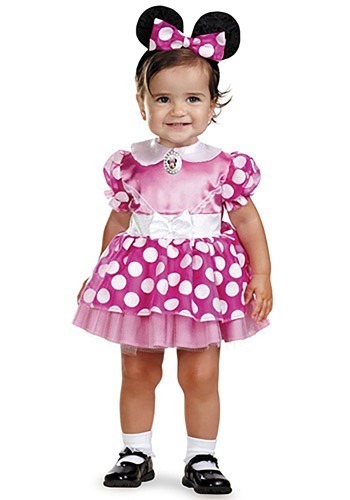 Start an adventure in this Infant Pink Minnie Mouse Costume! It's all ruffles and frills, with Minnie's favorite polka dots. Add tights and black patent shoes to complete the look. Your daughter will love dressing up in this adorable Minnie Mouse costume! This Infant Red Minnie My First Disney Costume is perfect for fans of classic animated features. It shows off Minnie's trademark polka dots. Pair it with our My First Disney Mickey Mouse costume for her brother! Have fun this Halloween season with Mickey, Pluto and the rest of the gang in this Kids Minnie Mouse Costume. Complete it when you add our white Dorothy socks and child Alice shoes! When it comes to style, Minnie Mouse has got it down. Her hair is always in place and her nails are always perfectly manicured. We know shes a mouse, but we definitely advise you to take fashion advice from her. 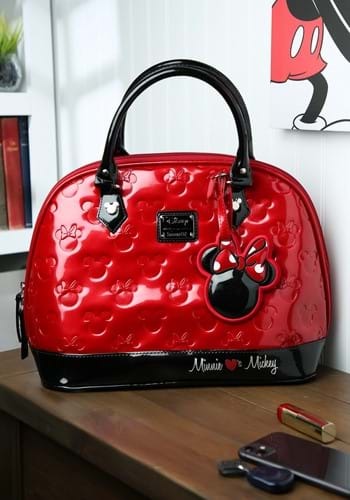 Her number one rule is to keep all your necessities in this Mickey and Minnie Red and Black Patent Embossed Bag. It's perfect for travelling or for trips to the mall! This comfy and cozy Mindy the Mouse Costume is perfect for her first Halloween or family fun photos! It's easy, too--you'll love it as much as she does. Although she always appears in red polka dotted dress with matching bow and gloves, Minnie was meant to have a blue and green outfit. Her first appearance was in Plane Crazy when Mickey invites her onto a plane he is piloting providing she gives him a kiss. She accepts but rejects the kiss mid-flight. He eventually forces her into a kiss but this only result in her parachuting out of the plane. 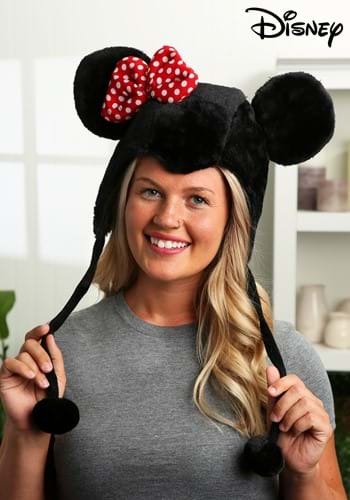 If she were wearing the Minnie Beanie do you think it would stay on her head? In the world of Disney there is only one mouse that is even cuter than Mickey and that is Minnie Mouse. This adorable little character has been playing around Disneyland with her best friend Daisy Duck for years. These two best friends have ridden every ride and tried every treat. And when they're not exploring the happiest place on earth these two have gone on some wonderfully cute adventures. Now your little girl can look just like the cutest mouse ever with the help of this soft accessory kit. Minnie Mouse is the best BFF a girl can have. She's got a unique and adorable fashion sense and she'll carry you things for you, or at least this tin version of the Disney cutie does! Store your treats or any of your essentials inside of her and you're ready to head out for some fun. Take a lesson from Walt Disney, it's kind of fun to do the impossible. While you're wearing the Minnie Mouse Headband think of all the impossible things you wish you could do. Go ahead, make your list, we won't tell. The Minnie Mouse hat is full of history! In 1929 Mickey announced to the world that Minne was his girl. Like any good *ahem* mouse, he did it through song. During Mickey's Follies he addresses an audience and says he's "Got a sweetie" who is "Neither fat nor skinny. she's my little Minnie Mouse". Finally! The world knows they are an official couple. Minnie Mouse is a pro when it comes to being cute. She's been rocking pink and polka dots since 1928, so she knows a thing or two about how to make an outfit stand out. 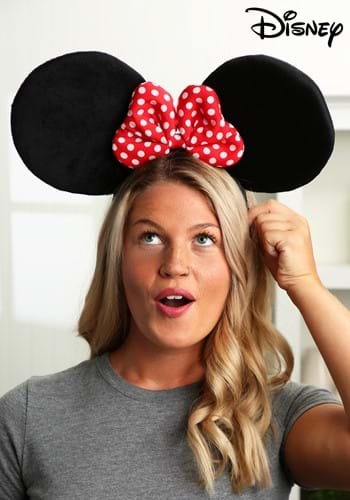 This Disney themed hoodie brings the famous mouse's look to you in a quick, cute and easy garment that you can wear as a costume, or just for fun. When you’re pressed for time why spend hours deciding what to wear? 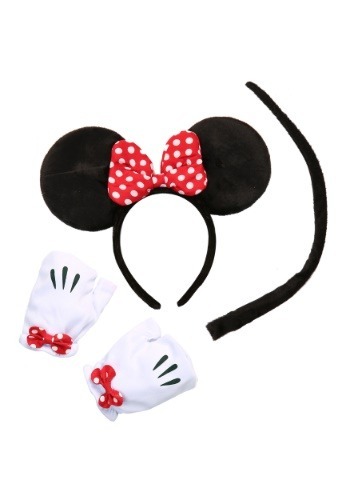 Our Minnie Mouse Tail Accessory Kit contains all the parts you need to recreate Disney’s iconic character! Mickey Mouse won't know what to do once he see you in your new look. Here comes Mickey's number one gal! You'll be a show stopper in a pair of Oversized Minnie Ears. The boys (and girls) at Walk Disney Imagineering couldn't have designed a more playful way to flaunt your love for the world's most adorable polka dotted mouse! Your little girl will love this exquisite Pink Minnie Mouse Costume! It's anything she could want--pink, glittery, ruffly, polka-dotted with a full skirt. You may want to add a petticoat for even more fullness. Finish this charming look with black patent shoes or glittery pink ballet flats, and she's ready for a trip to the Magic Kingdom! Polka dots, buttons, bows, and frills! Baby girls will look dainty and adorable in this Pink Minnie Prestige Infant Costume. The ear headband really completes the whole look. Minnie had better watch out, because there's now a newer, cuter, and way younger version of her. Be the cutest cartoon mouse ever in this Plus Size Flirty Mouse Costume, and Mickey will have competition for your attention! Finish it off with fishnet tights or anklet socks and black or red shoes. Are you ready for a magical good time? You will be when you wear this Disney inspired costume. This red dress along with Minnie Mouse ears will transform you into everyone's favorite little mouse. Pair this up with our great Mickey Mouse costume for a fun couples look this Halloween. Mickey will be drooling when he sees you! 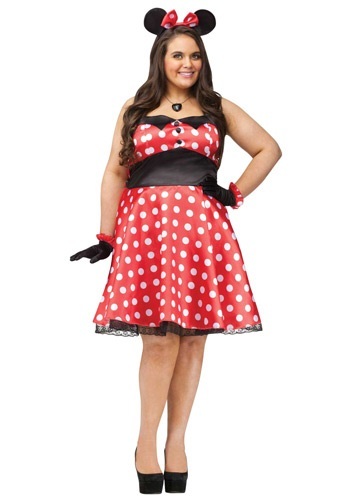 Channel the vintage style and your favorite girly mouse when you wear this Plus Size Retro Miss Mouse Costume. Just pick up a pair of black heels and you are set! If you only have one chance in your whole life to dress like Minnie Mouse, be sure you are dazzling in this red glam Minnie Mouse costume! It is covered in sparkling sequins and glitter so you'll shine bright with every step. If you go to the wonderful place known as Disney World you meet some of the most adorable of characters. One of the cutest ones you'll come across is Minnie Mouse and she is one of the most cheerful characters ever. She just loves hanging out with her friend Daisy Duck and her crush Mickey Mouse. 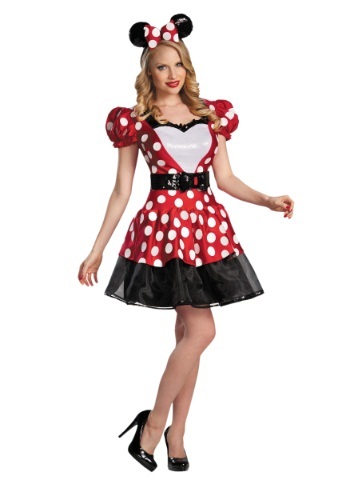 This Halloween you'll be all set for a Disney themed party with this Minnie classic adult costume. Pair this costume with one of our great Micky Mouse costumes for a fun couples idea. Looking to steal Minnie's man? He only goes for the cute mousy type, so you'd better have a set of ears and a tail. Well, if you're not lucky enough to have some of your own, we could hook you up with a set. Are you ready to have Daisy Duck and Clarabelle Cow over for a fancy dinner? The dinner plates and utensils are set, the mouse-house is spotless, but what on earth are you going to wear? This Red Minnie Tutu Prestige Costume is perfect for tea parties with your pals. The attached tutu gives this costume some extra bounce so it twirls when you twirl and the sparkly dots will twinkle in the sunlight! Make your favorite mouse say "Oh boy!" when you greet him wearing this Retro Miss Mouse Costume. 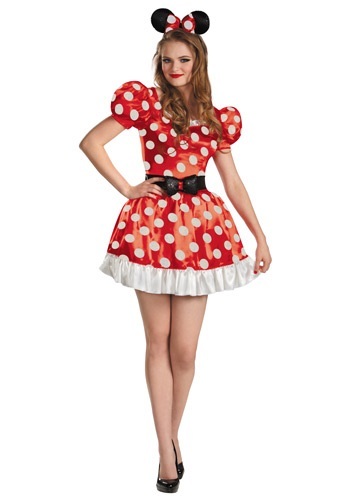 This cute polka dot costume gives off the vintage vibe so you'll look like a sweet mouse from years past. This costume looks especially cute when added to a group costume. Pick up a pair of red heels to match this adorable mouse costume. Give Minnie Mouse a makeover with this Sassy Miss Mouse Costume. Add a pair of black or red babydoll heels and elbow-length gloves for a sassy yet innocent Miss Mouse costume for Halloween! 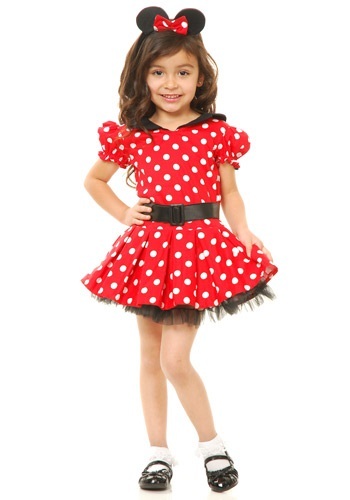 In this Toddler Minnie Mouse Costume your little girl will experience the magic of Disney! A Minnie Mouse character medallion is sewn at the center of the collar. Your toddler will love trick-or-treating in this adorable Minnie Mouse costume! Isn't this polka dot mouse just adorable? Your little girl will love wearing this cute Toddler Miss Mouse Costume. Just add a frilly petticoat and a pair of Mary Jane shoes. 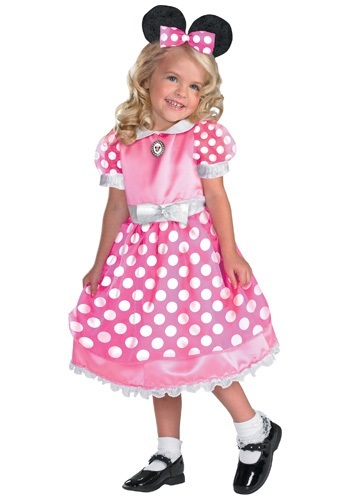 She'll love this frilly pink Toddler Missy Mouse Costume! It's great for Halloween, a dance recital, or everyday dress-up play. Finish it with black tights and shoes. For trick-or-treating, add a Disney-themed bag or pail! This Toddler Pink Minnie Mouse Motion Activated Light Up Costume has a headband that glows and blinks light with movement. She'll sparkle like a star when dancing with Mickey!